Last updated: Jan 5, 2019. 22:40 UTC. WordPress powers over 28 percent of all websites. Its incredible popularity is not just an accident. It is popular for many great reasons and is a favorite with both developers and novice users. I’ve set out forty reasons why I think you should use WordPress below. It’s popular and runs over 27% of all websites. WordPress currently runs 27.3 percent of all sites and just under 60 percent of websites using a content management system (CMS). WordPress is increasing its share every month, and I fully expect it to hit 29 percent by January 2018 based on my projections formed using data from W3Techs. No other CMS or website platform is even close to their market share or rate of growth. It’s Open Source with thousands of contributors. An open source CMS is one where the platform is built with code that is available for anyone to use, edit or redistribute. Such systems are usually developed collaboratively, by a large number of developers. Because WordPress is so popular, the WordPress community behind it is massive. This means you have many thousands, if not hundreds of thousands, of developers all helping to improve the core functionality via updates, new features, and bug fixes. Also, many web designers and web developers can create additional functionality via free (and premium) themes and plugins. None of this crowdsourced development would happen with a propriety system. WordPress is licensed under the GPL which was created to protect your freedoms. The WordPress Trademark is owned by a charitable organization. As part of this process, the rights to the WordPress logo and trademark were transferred to the Foundation. It’s nearly sixteen years old. WordPress was first released on 27 May 2003. This year (2019) it will be sixteen years old, with years of updates, bug fixes, security fixes and improvements under its belt. It’s trusted by some of the largest companies. If multi-million dollar (or even billion dollars) companies can trust WordPress, so can you. WordPress is trusted by Fortune 100 companies from Time.com, eBay, Reuters, NASA, Google Ventures, Forbes.com, and CNN, who all run their businesses and services on the platform. You don’t have to be a developer to contribute to the WordPress ecosystem. Anyone can contribute towards WordPress, even if not a developer. You can help answer questions on the support forums, suggest and vote on new features, write documentation, translate WordPress into your own language or even write WordPress tutorials on your own blog. It’s Free. You can use it for as many sites as you want. There are no fees or charges to use the WordPress content management platform so you can start using WordPress without paying a thing. I have already commented on the fact that WordPress is open source. The philosophy behind the open source movement is that the software is not treated like other tangible products. It can be modified or copied as many times as you want. One of the co-founders, Matt Mullenweg, for example, launched a company called Automattic which runs WordPress.com, as well as backup services such as VaultPress. Others make money by selling premium themes and plugins. There is also a whole ecosystem of services from managed hosting, to development all making money on the back of the free WordPress system. So while you may need to pay for hosting, or a premium theme and plugins, the core WordPress program is absolutely free. There are no tie-ins with service providers. Because WordPress is so widespread, there is an almost unlimited amount of professionals and services available. You’ll never be held hostage. This means you will never be locked down to a particular service provider, such as development or hosting companies. Nor will you be held hostage because your website is developed on a unique, bespoke system. Many free themes and plugins to choose from. There are over 51,000 WordPress plugins in the plugin repository and thousands of free themes. All can be installed on your website in seconds, allowing you to build your WordPress site easily and quickly with sophisticated functionality and features. Excellent value premium themes and plugins if you want something extra special. Even premium themes and plugins don’t cost the earth. You can purchase themes from around $30 - $55, which often include a suite of powerful premium plugins. 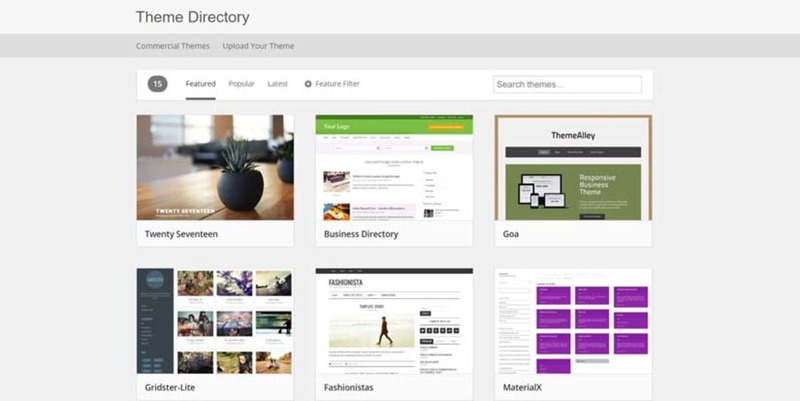 Premium WordPress themes at ThemeForest. © Screenshot. WordPress is incredibly easy to use. 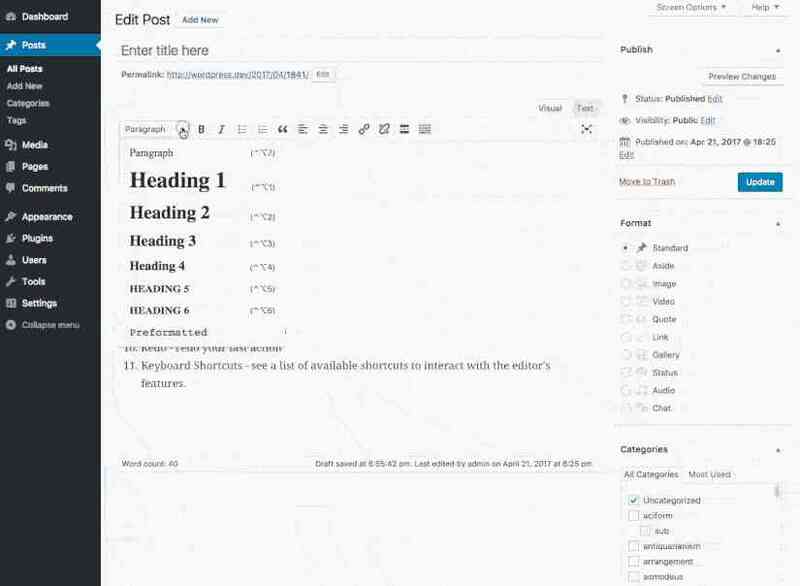 After the default WordPress installation, you can create new posts and pages using a WYSIWYG (What You See Is What You Get). This is an easy to use interface that is similar to Google Docs, or Microsoft Word allowing you to format text, create tables and headings (among other things) very easily. I’ve discussed this later in the article. WordPress is easy to install and upgrade. The popularity of WordPress has created a whole ecosystem of installers and managed WordPress Hosting providers, and websites creating tutorials to guide you through everything you need to know. In fact, you will struggle to find a hosting provider that does not offer one-click install, and if you do, I highly recommend changing hosts. With tutorials categorized by “for beginners,” “for intermediates,” “Troubleshooting,” “Design & Layout,” “Posting” and “File & Plugin Management” with each covering a range of subtopics, you can be sure to find solutions to any queries or issues you may have. You can find their documentation here. If the documentation doesn’t help you, or you have a unique query you can ask your question in the community-based forums. Community Support Forums. © Screenshot. 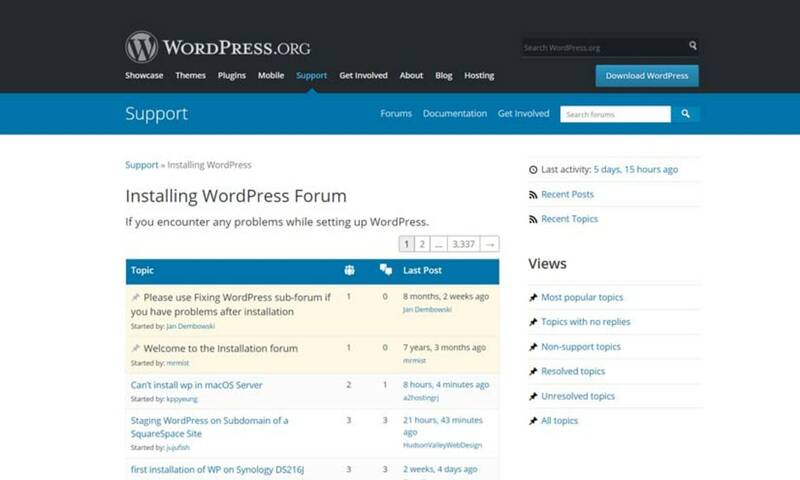 Not only do you have access to the official documentation, and support forum but due to the popularity of WordPress there are many thousands of websites all dedicated to producing WordPress related news, guides, tutorials, and other resources. Just like this website. If you have a problem, it is likely that a simple Google Search will throw up solutions. There are many hosting providers, like SiteGround, who are making a name for themselves by providing WordPress management (security, auto-upgrades, performance related features) and helpful support. If the documentation, forums, and other searches don’t help you, try opening a ticket with your hosting provider. While they may not help with website creation or theme specific queries, they will most likely help with fundamental WordPress issues. Quite often a major new release will bring issues for backward compatibility. This means that quite often you cannot upgrade without updating or rewriting your existing code. WordPress, on the other hand, strives to never break backward compatibility. It is one of their most important philosophies, making updates easier. All of the core WordPress generated code is in full compliance with the standards set by the W3C. As a result, your website will maintain forward compatibility with future browser version and technology. Publishing your content is easy with WordPress. You can create posts, pages, or even use custom page types to organize your content. You can use the WYSIWYG to format text, insert media, and then click the “Publish” button to instantly make that post live. Alternatively, “Save as a Draft” to work on the content over multiple sessions. If you need more sophisticated user management features, you can choose from an array of third-party plugins such as User Role Editor, or Advanced Access Manager. With the WordPress media manager, you can easily upload images, videos, pdf files, and other media. The process is simple with their easy drag and drop utility. This, coupled, with the ability to add alt text, captions and titles make it a powerful way to manage your media. Adding an image to your content is easy too, and can be done within a few clicks from within the WYSIWYG. WordPress comes prebuilt with a robust commenting system that contains everything you need to display and moderate comments. Furthermore, you can easily integrate WordPress with services such as Akismet to automatically filter our spam comments. You can read my in-depth tutorial on how to do this here. WordPress is available in more than 70 languages making it easy to use no matter what language you speak. If you wish to create a multilingual website, with all of your content in multiple languages, then you can do so with the WordPress Multilingual Plugin. If you are migrating from a different platform, there are many tools and plugins to help with this. WordPress itself comes with importers for blogger, LiveJournal, Movable Type, TypePad, Tumblr, and WordPress.com. Easily add social share buttons, integrate commenting systems with social media. You can automatically share your content to Social Media using plugins such as NextScript’s Social Networks Auto-Poster. These only include the ones listed in the WordPress plugin repository, and not premium plugins (although many premium plugins have a limited free functional version so they can get listed). Plugins allow you to extend the functionality of WordPress, with plugins for almost every conceivable feature. You can add elaborate galleries, drag and drop page builders, social networking functionality, forums, social media widgets, spam protection, calendars, fine-tune controls for search engine optimization, and create beautiful contact forms. 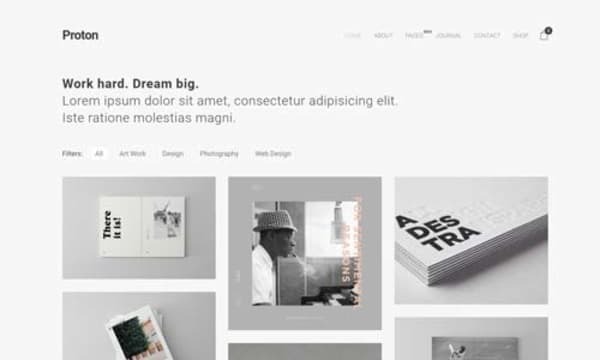 Easy Theme System WordPress comes bundled with two default themes, but if they aren’t for you, there’s a theme directory with thousands of themes for you to create a beautiful website. None of those to your taste? Upload your own theme with the click of a button. It only takes a few seconds for you to give your website a complete makeover. Free WordPress themes at WordPress.org. © Screenshot. WordPress websites are easily scalable. Start off with a simple blog, website, or e-commerce store and over time expand the website to contain multiple sections, more functionality, and even multi-site capabilities. A scalable approach allows you to get up and running cheaply, and quickly, with the ability to continuously improve and expand at your leisure. #1. Search - While the WordPress sites search functionality is suited for most websites, it may become sluggish for a large website containing millions of posts. In these situations, you can integrate with open-source solutions such as Elasticsearch or Solr. These can provide near-instant search results across millions of posts without batting an eye. #2. Caching - WordPress is a dynamic application reliant on database and PHP queries to produce the pages when requested by the browser. By caching the results of those queries, it prevents the need for those resources to be used. Instead, it server static cache that can more easily scale to millions of users and significantly speeds up your web page load time. An excellent tutorial for configuring caching via W3 Total Cache can be found here. #3. Content delivery networks (CDN)- A CDN is a scalable network file storage system that stores and distributes your media files separately from the WordPress installation \ server. This significantly improves page load times by serving static assets from servers local to your users. #4. Load balancing - WordPress can be configured to utilize multiple servers, with the load being balanced between them so that no individual server is overloaded. Advanced configurations can almost infinitely continue to add servers as your web traffic grows. You can even have servers in different regions to serve traffic more locally. #5. Powerful WordPress hosting - Many hosting providers provide the features specified above making it easy to implement. For really high traffic someone like WP Engine may be your best bet. For many people, though without great traffic needs, a specialist WordPress hosting provider such as SiteGround should suffice. When choosing your WordPress theme, you should pick one that is SEO-friendly. This will help increase your traffic from the search engines. Fortunately, with the inbuilt SEO features (permalinks, sitemaps, good content structure) most of the technical side is already taken care of before the theme settings and templates come in to play. Most themes these days include all the relevant SEO markup, such as Title, Description and other meta tags. Many of them are optimized for speed, which is likely to become a Google Ranking factor with the new Mobile-first index update coming in late 2017. With mobile-friendliness being a Google ranking factor, it is important that your website is optimized for mobile. Fortunately, the significant majority of WordPress themes are responsive. By this, I mean that they adapt to the screen size of your device. While not a direct Google ranking Factor, WordPress websites utilizing the new Accelerated Mobile Pages (AMP) can gain more visibility in the search results. AMP pages work, by creating a version of the page that is highly optimized, and adhering to stringent coding standards. These are then cached by Google and shown in the mobile search results, significantly improving the load time on slow mobile devices. You can read more about AMP pages here. One of the most significant Google Ranking Factors is having great content. This coupled with a good organization (i.e.,. Website Structure) can significantly improve your website’s visibility. WordPress structures your content by organizing it into pages, blog posts, categories, and tags. By taking a careful and considered approach to this (i.e., not spamming tags and categories with just one entry), you can ensure the structure of your website enables proper internal linking to your most important pages \ groups of pages. The permalink structure can help with your SEO. For example, you can add dates to your blog posts, and parent pages to your pages. Furthermore, your permalinks are optimized for SEO by allowing them to be both human readable and keyword rich. You can read more about how having keywords in your URL are a ranking factor here. As I have already mentioned, WordPress allows you to install third-party plugins to improve its functionality significantly. There is one SEO plugin that I highly recommend; Yoast. #2. Google Preview - See what your post will look like in the search results. #3. Readability check - Flesch Reading Ease score. #4. Breadcrumb configuration - Gain full control over your breadcrumbs to aid website structure, including setting a primary category. #5. No duplicate content - Indicate to Google the preferred version of any duplicate content by setting canonical URLs. #6. Technical improvements - Optimized settings for robots.txt, .htaccess files, permalink URLs and sitemaps. #1. Text link counter - Improve website structure by seeing how many internal links point to any page on your website. Because WordPress is so popular, a whole generation of SEO specialists knows WordPress inside out. They know how to configure Plugins like Yoast, set up your website structure, as well as ensure all the other technical considerations are properly thought out and set. 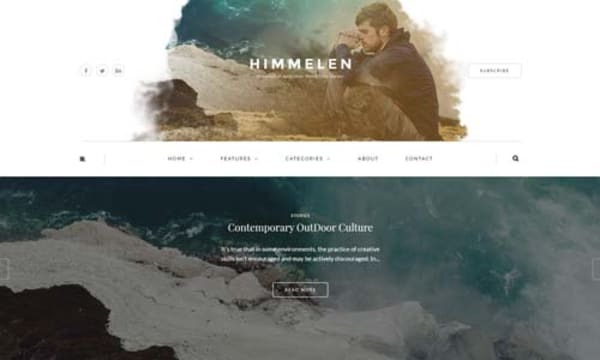 Himmelen is an Elegant, Clean and Creative WordPress blog theme. It is particularly suited to personal blogs about travel, inspirations, food, fashions news, photos, weddings and everyday moments from all over the world. Whatever you wish to cover in your WordPress blog, there is a stunning design waiting. 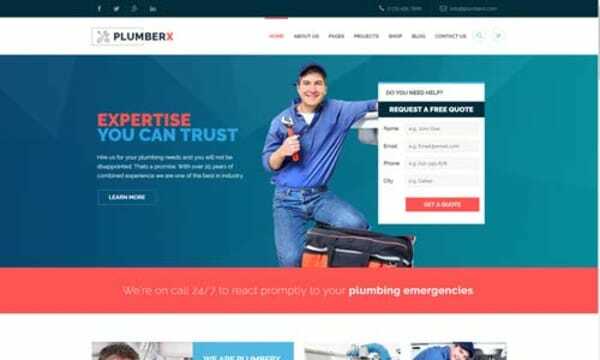 Plumber WordPress Theme is designed primarily for plumbers, electricians, handyman, roof repairing, other repairing and construction companies. It is fully responsive, and comes with a sophisticated drag and drop page builder. If you have a business website, chances are that a web designer has made a theme specifically for your business type. Shopkeeper is a fully responsive mobile-friendly Premium WooCommerce Theme with a great customizable design and extensive functionality. 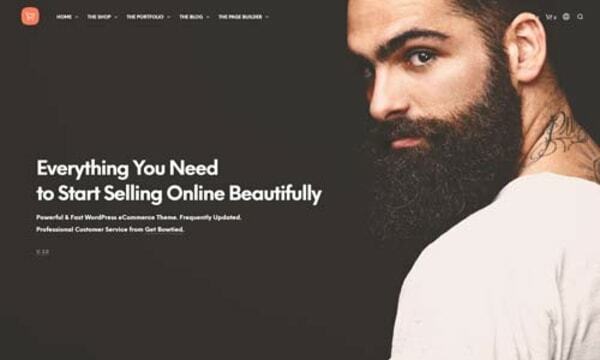 Many ecommerce sites use WordPress, and the WooCommerce Plugin is one of the most advanced, yet simple, ways to start an online store. Proton is a high quality responsive mobile-friendly portfolio theme with great style and clean code. Proton can be used for many purposes starting from minimal portfolios, agencies, freelancers and much more. 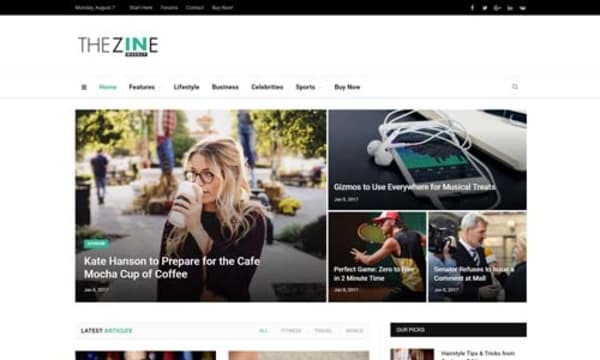 SmartMag is a modern, clean, responsive and retina-ready (HD) WordPress theme suitable for magazines, newspapers, review websites, or blogs.